In this section, we will begin to apply what we've learned to a section of Scripture. We will begin studying the book of Genesis using the Tracking God methods. This will allow you to actually practice your skills by following the outline below. There are four lessons with questions and and suggestions for study. Read Genesis chapter 1 through completely several times before proceeding with the lesson. Now read some other creation stories from world literature such as the story of Gilgemish, or any other resource you may have available. What kind of deity is characterized by the different creation stories? 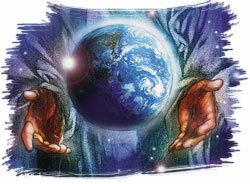 What creation story appeals to you and for what reason?